What “City, Country” do you live in? What was the last country you visited other than your own (or that you want to if you haven’t been out of your country)? What is your favourite kind of trip (i.e. camping, laying on the beach, cruise, etc.)? What is the farthest location south that you have gone? Either Hobart or the South-West wilderness in Tasmania. What is the farthest location north that you have gone? Uppsala in Sweden. For the wedding of a friend from NZ! What is your preferred mode of transportation when traveling long distances? What kind of vehicle do you own (or would like to own)? Alfa Romeo 147 2.0 T Spark. It has red leather seats: a long-held ambition. What is your ideal destination? Oahu, Hawaii or Stockholm, Sweden. I love them both for many reasons. Who is your favourite travel companion? Brad Pitt. If you ask him, he'll get all embarrassed and deny it. What is the largest city you have visited? What destination would you recommend to a friend? 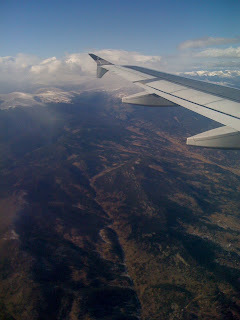 The image is from 2009, somewhere over Colorado on my way to Denver.